Fineway Launch Hire01603 782309work Boat HireWe are a family run boat hire company in Wroxham offering 3 different sized boats. Electric boats for up to 6 people and diesel boats for up to 11 people including several small children. We are open all year using the larger boats in the winter as they have heaters. We have our own free carpark and toilets. 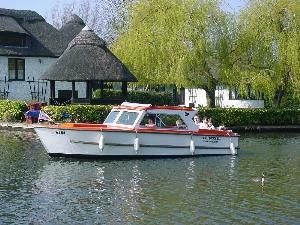 We are a family run boat hire company in Wroxham offering 3 different sized boats. Electric boats for up to 6 people and diesel boats for up to 11 people including several small children. Booking is always advisable especially in the school holidays. Open from 8.00am till dusk. All boats must be back by dusk. Evenings by arrangement. Closed some Sundays in the winter due to staff holidays. Prices from £13 per hour and £75 per boat per day. Take A1151 from Norwich to Wroxham. Cross over the river bridge, turn right at crossroads. Keep McDonalds on your left into Church Road and our car park is in the first gateway on the right. Look for yellow and blue signs.